Do good stories have legs? You bet. Here it is, almost four months since we reported in our July 30th issue a story titled "Pork-For-Tuition Program Shows Creativity." It related how a small private college, Lindenwood University in St. Charles (MO), was trading a liberal arts education--retail value $11,200 a year--for any commodity the dining hall could use. Warren contends we will see a continuing pattern of ingenuity, as evidenced by actions taken elsewhere: Defiance College (OH) is trading (paying for) a portion of tuition to top students who pledge to spend several hours a week in volunteer work. Students who cheer on the college's sports teams (trading their time) receive a credit at William Woods University in Fulton (MO). Clark University in Worcester (MA) is also in a trading mode, offering a free fifth year of education to pursue a master's degree to all who maintain B+ averages or better as undergrads. A dozen other small private colleges have signed on with trade exchanges, providing families' students the opportunity to attend college on a barter basis--by accepting trade dollars as full or partial payment for the college tuition. Over the last five or six years there's been a concern, by some within the commercial barter industry, about the lull in new barter company startups. Two interesting contacts this past week suggest this may be changing. The first was from a gentleman in Canada, a member of a local Canadian business association with 150 members...encompassing all categories of merchants and trades. He indicated they are now going to start a trade exchange "to add an extra benefit for our members," and to "use it to attract the 600 or so potential new members in the area." Far away, a contact who lives in Jerusalem says he's a part of a worldwide non-profit organization. "I have been studying barter now for about a month. I'm sold." It was a lengthy missive, but essentially he shared the fact that he currently has a small business in Israel and noted how terrible their economy is, "business here is very difficult, it is not swimming with the sharks, it's swimming with the killer whales." The tension, distrust, and competitiveness is profound, he said, "It looks too difficult here, I probably will relocate to India, where there is a substantial middle class." And last week's lead story about three new barter companies in China, slated to handle the country's huge idle inventories, will see one of our readers making a December visit to Shanghai to meet and establish business relationships with the new barter entities in China. Entrepreneurship is quietly taking place all around the globe! A $500 million "Barter Fund" announced by IBM. FASB says barter must meet a cash standard. Transfer buying is the way for small business owners to generate faster growth and greater cash flow. Coming Soon...We Will Be Covering The World! Barter companies and contacts around the world will soon be listed on our web site. 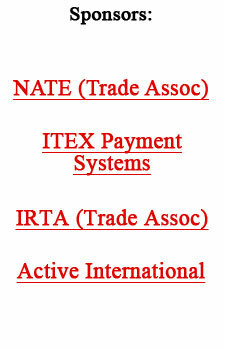 We presently have barter company information for the U.S., Canada, and Australia. It's that time of the year...trade exchanges across the country will be holding their annual barter fairs and expo's...enabling their clients to make needed holiday purchases on trade. Here are a few we've come across. BarterNet (Brentwood, CA) Holiday Fair will be held Saturday, November 23, at the Crown Plaza in Pleasanton. For details: (925) 516-5600. Barter Business Unlimited (Newington, CT) 11th Annual Barter Expo 2002 will be held Tuesday, December 3, at the Connecticut Expo Center in Hartford. For information: (860) 493-1305. BXI Columbus (Columbus, OH) Holiday Barter Fair will be held Thursday, December 5, at the Aladdin Shrine Complex in Columbus. For details: (614) 848-7788. BXI Orange County (Huntington Beach, CA) Holiday Barter Fair will be taking place on Sunday, December 15, at the Orange County Fairgrounds, Bldg. 10 at 88 Fair Drive, in Costa Mesa. For information: (714) 847-5477. If you would like your event mentioned in next week's issue, send us the information via email: "Holiday Event" to bmeyer@barternews.com. Major retailer Ikea wants to open a store on Philadelphia's waterfront, on a large prime site now owned by CSX Corp. At the present time the Delaware River Port Authority opposes the acquisition...but they're willing to drop their opposition for a price. A barter deal is in the works where CSX will provide several of its other waterfront properties to the port authority, in exchange for dropping its opposition to the rezoning of the proposed Ikea site. CSX is going forward with the barter proposition because the zoning change could triple the site's value to a reported $25 million, which Ikea will pay CSX to acquire the 44 acres. You can obtain every available back-issue of BarterNews...the official publication of the reciprocal trade industry. The Massachusetts Office of Travel and Tourism (MOTT) has banded together with the Massachusetts Lodging Association (MLA) to promote new winter packages at more than 80 of the state's hotels and inns. More than 50 properties donated room nights worth a total cash value of $56,000, which will be used by MOTT and MLA to barter for advertising in their promotional efforts. With the strong residential real estate market (prices rising), what does the bankruptcy filing of the nation's #2 retailer of manufactured homes--Oakwood Homes--suggest? Most likely scenario, large defaults on loans from consumers who purchased Oakwood's mobile homes. "Buy Nothing Day," which started in the United States on November 30, 1993, has taken a stronger hold in other parts of the world. One reason may be that the date follows Thanksgiving in the U.S., which is a major shopping weekend...a kick-off for the holidays. However, in Ireland this year, to mark the day when people are challenged to go a day without spending money they are staging a Barter Fair in Talway city. Peter Rinnig, former art director at the search engine company Terra Lycos in Waltham (MA), has purchased QRST Inc., a T-shirt manufacturer and design company. To help finance the deal, he and his wife took out $100,000 in equity from their home and will be paying a percentage of the gross revenue over the next five years to the former owner. He is now adding new clients and doing considerable advertising through various barter deals. One direct trade sees Rinnig providing T-shirts to Boston Phoenix Communications in exchange for free advertising. This major shift will offer China another source of capital, and has vast implications both inside and outside China. The country's two domestic stock markets have gone from experimental start-ups to Asia's third-largest markets in little more than a decade, with 1,200 publicly traded companies and nearly $500 billion in total capitalization. In the years ahead, China's market liberalization could also pave the way for a portion of the country's nearly $1 trillion in domestic savings to begin entering overseas markets, too. What is investment advice worth in a tough stock market? Well consider this: Of the 2,420 U.S. diversified stock funds tracked by Morningstar Inc., only 139 funds haven't lost money for clients during the past 12 months. CEO charisma still is important, as long as it's not confused with self aggrandizement, according to Bradley Agle (University of Pittsburgh professor) and Jeffrey Sonnenfeld (president of Yale's Chief Executive Leadership Institute and associate dean at the Yale School of Management). According to their study, looking at 250 CEOs of major U.S. firms and their 1,540 management committee members' evaluations, the more charismatic the CEO the better the firm's performance. With roughly 10% to 15% of performance coming from the degree of charisma. Their research disclosed that charisma is more than showmanship and backslapping...which other scholars and the media assumed. In addition to personal dynamism and empathy, there is also a value put on authenticity, goal setting, and risk seeking.